I feel like I’ve skimmed over so much that deserves more detail in this amazing Northern Territory. So, I’m going to try and recap some of the places we’ve visited and give each place the justifiable rap it deserves. Darwin, I think I’ve covered. Apologies for not get the promised photo of the masses on Mindil Beach at sunset on market night. We forgot to take our camera the second time we went. Now I’ll try and re-cap our visits to Berry Springs. What a place. It’s around 50 kms south of Darwin. It’s not a place to venture into during the wet season, in fact none of the natural swimming holes are, but more on that later. During the dry season Berry Springs is one of the more trusted of the water holes that even the locals use. Apparently, there are fresh water crocs there, but as freshies are rather timid creatures and not man eaters, they generally make themselves scarce. We visited this place twice, and enjoyed a marvellous swim there. It’s a place you could easily spend a day at, either taking your own picnic lunch or there are food vans and a kiosk there. The water is pleasantly warm at around 30 degrees and crystal clear, and there are steps and hand rails for entering the water. The banks are surrounded by monsoonal forest palms and trees, so rather a stunning ambience . Floating around the different pools there was very relaxing. A must see and do place for anyone visiting the NT, and preferably plan on spending the better part of a day there. It’s not hard to do. 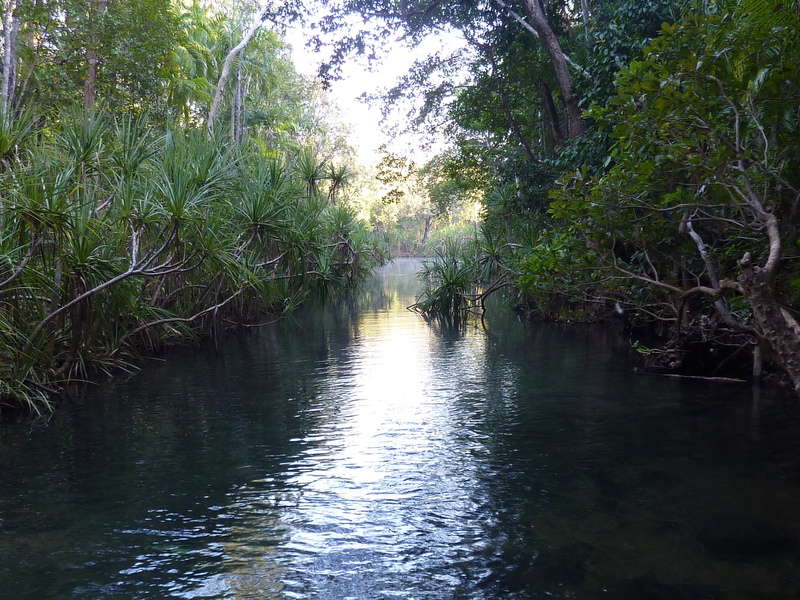 In the wet season though, most swimming holes are a ‘no go’ as the waters rise. Crocodiles are increasing in numbers now. They nearly became extinct in the 1960s and so became protected. Add to that the fact that the Cane Toad has severely diminished one of the crocodiles only predators – the goanna. Yes, you read that correctly, the little goanna. It loves crocodile eggs. So now crocodile numbers are well and truly on the rise. As they’re territorial, increasing numbers means they need to move further and further upstream to establish their own territory. So they’re now being found in places seldom seen before. In the wet season as smaller pools get joined up with each other to form larger pools, the crocodiles move into swimming holes, and the swimming holes get closed to the public until the dry season returns. At the beginning of the dry, salties in swimming holes are trapped and transported to other places, before once again the swimming hole is declared reasonably safe for humans to venture into. There’s never any guarantees though, and some locals won’t chance swimming anywhere except a back yard pool even in the dry.